Dr. Rudman has been a restorative dentist in Warwick, RI since 1982. He believes strongly in saving, not extracting teeth. In addition to general dentistry, Dr. Rudman has been placing implants for over seven years, and restoring them for over twenty. He has been an Invisalign provider for several years. With this new technology, Dr. Rudman is able to provide beautiful smiles with little or no conventional dental work. 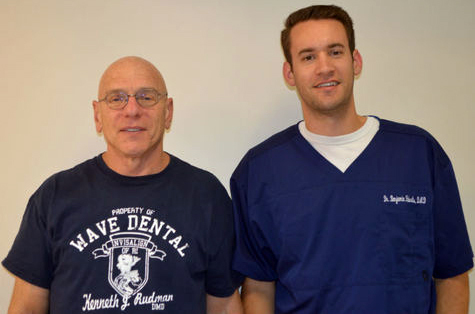 Dr. Rudman was voted one of Rhode Island's Top Dentists by his peers. He earned both his Bachelors and Doctor of Dental Medicine degrees from Tufts University. Dr. Roberts completed dental school at The University of New England in 2018. He is a native of Rhode Island, attending South Kingstown High School. Dr. Roberts recently presented at the American Academy of Cosmetic Dentistry Conference in April of 2018 in Chicago. He has brought his care and expertise to the Wave Dental community. Our exceptional, friendly staff is our greatest asset. Our dental assistants and hygienists are licensed professionals who pride themselves on staying on the cutting edge of dentistry and patient communication. They are excited about what they are doing, have high standards of quality and integrity, and are motivated to achieve the best results for our family of patients. We love what we do, and it shows on our faces - it seems we're always smiling around here. You'll find our staff is friendly and upbeat, and we will do our best to make your visit comfortable, and even fun. All the while we will be providing you with the highest quality dental care. Don't be surprised if it's the best time you have had in a dental office. Liz has been a vital member of our team since 1995. She works behind the scenes with matters of insurance and patient finances. She spends a great deal of time understanding many insurance policies and has helped many of our patients set up monthly payments with Care Credit when it is needed. Liz is skilled at maximizing insurance benefits for our patients. You will always get a warm welcome from her. Feel free to approach her with any questions you might have. Kim is a Registered Dental Hygienist who has been with Dr. Rudman since 1996. She graduated from CCRI in 1997, and has the distinction of being Dr. Rudman’s most senior employee. She has known some of her patients so long that they are like family. Her favorite part of hygiene is helping her patients achieve optimum oral health. "The best part about this job is the relationships I have had the pleasure to make with our wonderful patients." Sam is a Registered Hygienist who has been with Dr. Rudman for over 10 years. She graduated from CCRI in 1996. Sam prides herself on being very particular and very gentle. As a hygienist, she enjoys helping to create and maintain beautiful, healthy smiles. Sam also enjoys helping all her patients maintain optimum oral health by keeping abreast of the latest technology and advances in the hygiene field. Sam is fluent in Spanish. Sue started as one of Dr. Rudman's certified dental assistants before pursuing a degree in dental hygiene. After attending hygiene school at CCRI, she joined the practice as a hygienist. Sue takes tremendous pride in being able to put patients at ease when they visit us for dental treatment. She comes to work everyday excited about the services and enhanced care we provide at our office. "Working in this office has given me the opportunity to love my job and provide assistance to people who are in need of dental care." Amanda has been apart of our team since 2016. She started as a dental assistant and is x-ray certified. Amanda is now working at the front desk as a billing coordinator, scheduler, and other various tasks. One of those tasks is programming the digital sign out front. If you have any requests for the sign, please feel free to give us a call and ask for Amanda. Sydney has been a dental assistant here at Wave Dental since February of 2016. Sydney is currently continuing her education at CCRI, pursuing a degree in dental hygiene. Warwick has such a great community and she feels lucky to be apart of it! Sydney loves to work with our patients and loves helping them keep healthy smiles!